On May 28, the Boston Diversity Committee hosted "Speaking with Poise and Professionalism," a discussion with Partner Mark Fleming and Counsel Kevin Prussia. 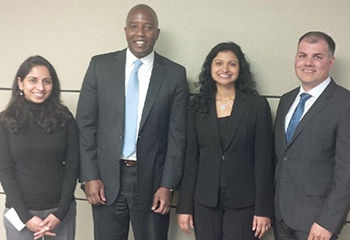 The event was co-hosted by the South Asian Bar Association of Greater Boston (SABAGB), an organization with which the firm has a longstanding relationship. The idea for the event came from Senior Associate Thaila Sundaresan, who joined SABAGB's board of directors in January and currently serves as chair of its mentorship committee. "WilmerHale has long been a generous supporter of SABAGB, but we had never done an event like this with the organization," says Sundaresan. "Once Mark joined SABAGB's advisory board, I thought it would be a good opportunity to host an event that would showcase his new role and his practice. Since he's such a strong speaker and has argued before the US Supreme Court and other federal appellate courts nationwide, it was a natural fit for the event to focus on public speaking." Sundaresan wanted to bring on another strong and dynamic public speaker, and asked Prussia to take part in the event as well. Following opening remarks by Partner Monica Grewal, chair of the Boston Diversity Committee, and SABAGB President Gauri Patil Punjabi, Sundaresan introduced Fleming and Prussia, who shared their tips and perspectives on public speaking before an audience of 55 WilmerHale attorneys, summer associates and SABAGB members. The presentation focused on how to articulate ideas succinctly and persuasively in order to communicate them in meetings, interact with clients, impress supervisors, and present arguments in court. "The ability to make an impactful and professional impression is an invaluable skill, especially for someone making the transition from law school to full-time legal practice," says Summer Associate Nina Garcia. "This event provided great insight into the level of preparation that WilmerHale attorneys apply to all aspects of their practice, whether it be an educational workshop for summer associates or an oral argument before the Supreme Court. Kevin and Mark's presentations demonstrated that personality, deliberation and preparedness are the hallmarks of great attorneys. The firm is clearly committed to advancing the professional development of all lawyers, and it was great to see that goal in action through this collaboration with SABAGB."